The 2018 Ford EcoSport and Ford Edge satisfy your crossover cravings with punchy performance and rich interior comfort. Making a choice between these two crossovers will likely come down to how much power and passenger space you need. Check out our buying guide to learn more. The 2018 Ford EcoSport is a subcompact crossover with a surprisingly spacious cabin and enough cargo space for a family-filled trip. The mid-grade SE and up come standard with dual-zone climate control and heated front seats, creating a cozy cabin in the face of extreme outdoor temperatures. Behind the rear seats, you can fill 20.9 cubic feet of cargo space with your overnight bags and golf clubs. For a bit more passenger space, check out the 2018 Ford Edge. Whereas the EcoSport offers 91.1 cubic feet of total passenger volume, the Edge kicks things up a notch with 113.9 cubes. Because it expands leg and elbow room, the Edge may be the preferred choice for taller families. 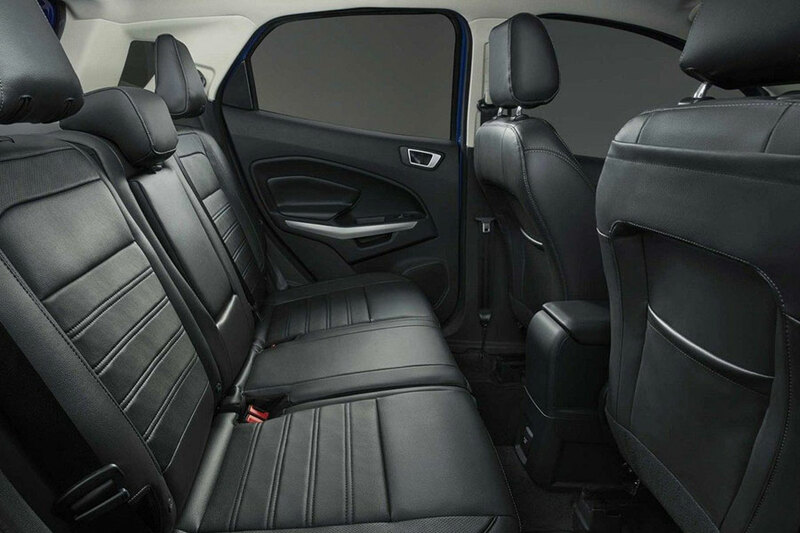 The Edge also features plush front seats with optional heaters and coolers for enhanced comfort in extreme climates. Not only does the 2018 Ford EcoSport offer plenty of pep, but it's also the more fuel-efficient of the two crossovers. With its turbocharged 1.0-liter three-cylinder engine, this subcompact crossover earns 27 city/29 highway mpg. The Edge's thriftiest engine is a turbocharged 2.0-liter four-cylinder, which helps you maintain a healthy fuel budget with EPA ratings of 21/29 mpg. Both the EcoSport and the Edge offer optional all-wheel drive. (This technology is standard equipment on the performance-driven Edge Sport model.) When Ford's all-wheel-drive system detects slippage, it sends power to all four wheels for maximum traction when you need it most. However, the Edge might be the more rugged of the two. When you add the Class II Trailer Tow package, this mid-size crossover tows up to 3,500 pounds, lugging your boat to the shore with ease. Both the 2018 Ford EcoSport and Edge offer a similar tech lineup, with the only differences being which feature comes with which trim model. For example, all but the base EcoSport come standard with the Sync 3 infotainment system. On the Edge, Sync 3 is optional for the mid-grade SEL and standard on the top-trim Titanium and Sport models. Sync 3 technology is user-friendly, thanks to its responsive touchscreen and intuitive menu system. 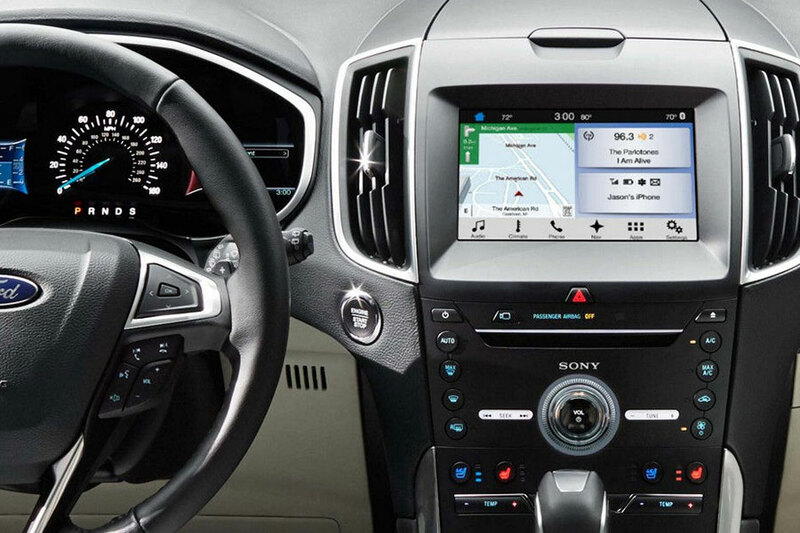 You'll also like the system's Apple CarPlay and Android Auto capabilities, which make it easy to stay connected by displaying smartphone apps on your central touchscreen. You can also use your phone's Siri and Google Assistant voice controls to access settings without lifting a finger from the wheel. You will notice a few differences. The 2018 Ford EcoSport has more of a modern touch, offering keyless entry and ignition on its mid-grade SE model. On the mid-grade Edge SEL, you'll find a keyless entry pad instead. The EcoSport's 110-volt household-style power outlet makes charging a laptop easy from anywhere. You won't find this technology on the Edge. If you're looking for the most in high-tech driver aids, check out the 2018 Ford Edge. Among its many options are a forward collision warning system that lets you know when you need to slow down to avoid an accident. The 180-degree front camera helps you see what's around a corner. The Edge's automated parking system is perfect for anyone who has trouble navigating small spaces. In the 2018 Ford EcoSport, you'll find blind-spot monitoring to help you switch lanes safely. However, no other advanced driver aids are offered for this subcompact crossover. While they have a lot in common, the 2018 Ford EcoSport and Ford Edge ultimately appeal to different kind of buyers. If you want a crossover that does double-duty as a family-friendly hauler and a fuel-efficient commuter, check out the EcoSport. On the other hand, the 2018 Ford Edge offers increased passenger and cargo space, offering comfortable accommodations for children and adults alike. This mid-size crossover also increases the safety quotient with a longer list of optional driver aids, such as forward collision warning.